Hotel America offers its guests 18 stylishly furnished, comfortable design rooms in four categories. Each room is equipped with the valuable mattresses that guarantee the perfect relaxation due to their height and filling. All our beds are finished in extra sizes to provide even more sleeping comfort. We attach great importance to the wellness and wellbeing of our guests. In winter 2011 all the rooms were fully renovated and outfitted with the new elegant furniture and bathrooms. Each design room or suite has its own individual character. Inspired with the nature, we divided our rooms in three primary elements: sun, water and earth. In the category Comfort Design we offer you modern, stylishly furnished, comfortable double rooms, which can be booked for two as well as for one person. All the rooms are very refined, bright and decorated with beautiful frescos. In the category Superior Design we offer our guests large, elegant and comfortable design rooms. 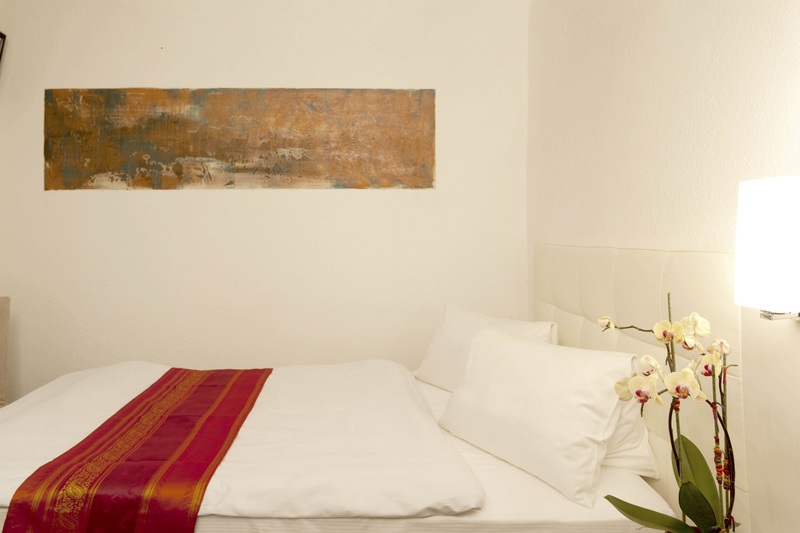 Each Superior room is equipped with a commodious bathroom a sofa and exclusive furniture. The rooms can be booked for two as well as for three persons. Family suites consist of 2 Standard double rooms connected with a common corridor. There is one bathroom and each room is decorated with nice frescos and paintings. Bookable for four, three or two persons. For the guests travelling alone we offer our simple and pretty single rooms. The rooms are stylishly furnished and very comfortable. Each single room can be also booked for two people. All the room rates are given per room and night, incl. breakfast buffet, service and VAT. Payment upon arrival. Room rate during Moon & Stars, Film festival and on New Year: on demand. Room rate for families and groups: on demand.